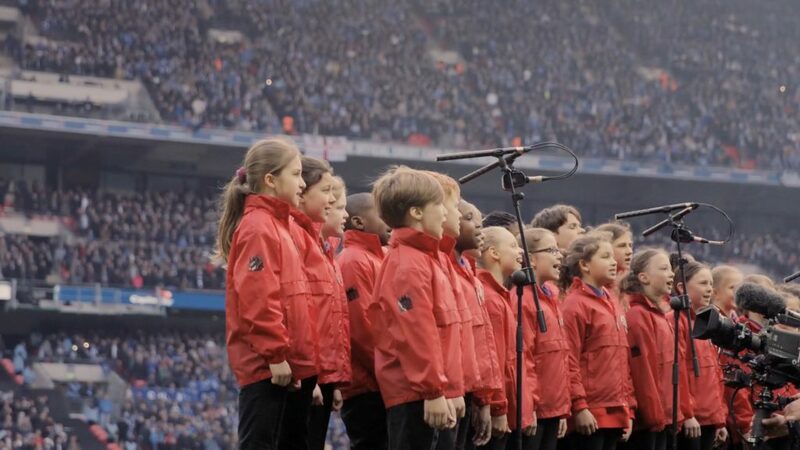 The 2015 Capital One Cup Final was made all the more special for a merry band of competition winners, who joined the London Youth Choir to become the final’s official Little Legends, where they were given a once-in-a-lifetime chance to take over Wembley and help put on an amazing show. Each Little Legend had an important part to play at the final. Such daunting tasks obviously requires a pre-match pep talk — in this case given by Kaiser Chief’s frontman Ricky Wilson. The film shows Ricky’s surprise introduction to the Legends at Wembley before the big game. A few words of wisdom are given by The Voice’s most charming judge and then our Legends are off and away: we’re fully immersed into their special day with Tareq’s gently observational film giving us an exhilarating look at all the different amazing roles the Legends had at of football’s biggest occasions — from flag-barers to kit-hangers, spot-kickers to journalists, all done in front of 90,000 fans. The film demonstrates Tareq’s now well-established documentary filming talent, always perfectly capturing ‘The Moment’ in any environment. Seeing the London Youth Choir give us a stirring rendition of the national anthem is a highlight, with the joy written across the faces of all the Little Legends as they do their dream job particularly heart-warming. We’re gently guided through the Little Legends’ momentous day with a deft narrative touch that is a real pleasure to watch.